Hi all! If you've never used a body conditioner before, this is definitely the recipe to try as it's our personal favourite. 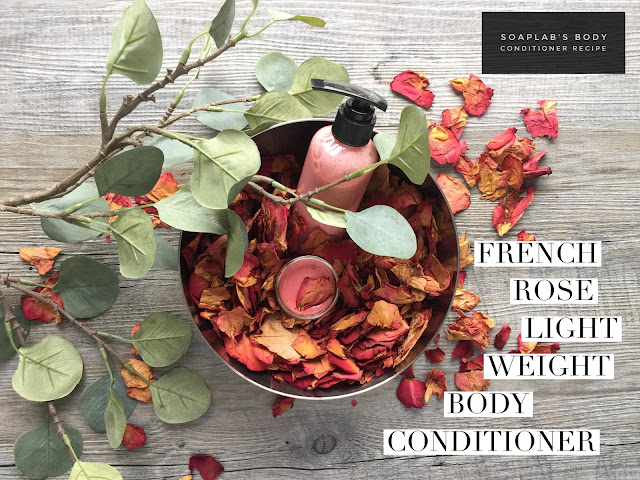 From the benefits, color and scent... you'll be taken to a flower garden and your skin will feel as supple and smooth as a rose petal. This conditioner works best on those with normal to oily skin as we made it purposely lightweight so that it doesn't make your skin feel sticky. This conditioner with rose hip oil corrects dark spots, reduce fine lines, hydrate dry and itchy skin...what else can you ask for? We also use geranium essential oil for its anti inflammation and soothing properties, which you'll thank us for if you spend long days outdoors or in air conditioned environments. To help deep cleanse your skin, we've used French Rose pink clay so that your skin can renew itself, leaving you feeling great!